Last weekend I went to SoHo to meet up with my fabulous friend Heidi, who has a great eye for design and works for one of NYC’s #1 interior designer. Anyway, we headed over to Purl Soho to buy some fabric so I could make some pillows to update an old chair. Thank goodness Heidi was there! 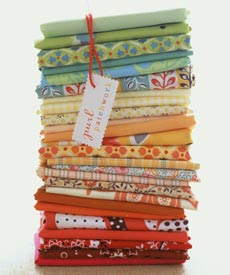 So many fabrics I liked! 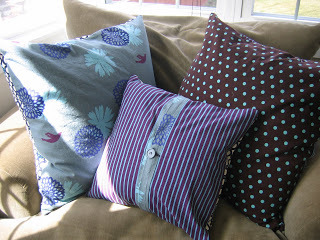 It was fun to see what fabrics I started out with but actually ended up buying. 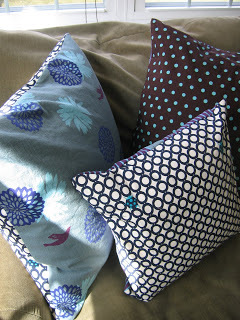 The pillows look fantastic! I’m glad we didn’t go with any green. Next stop your bedroom curtains. That a girl! Love the pillows! 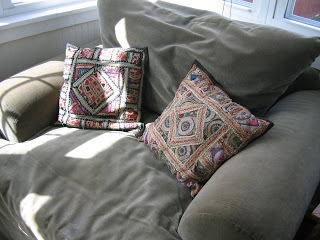 Yes, my old Urban Chic chair and sofa are still alive! Girl, i really need some tutoring from you. Can I fly you out and turn my sad house over to you?